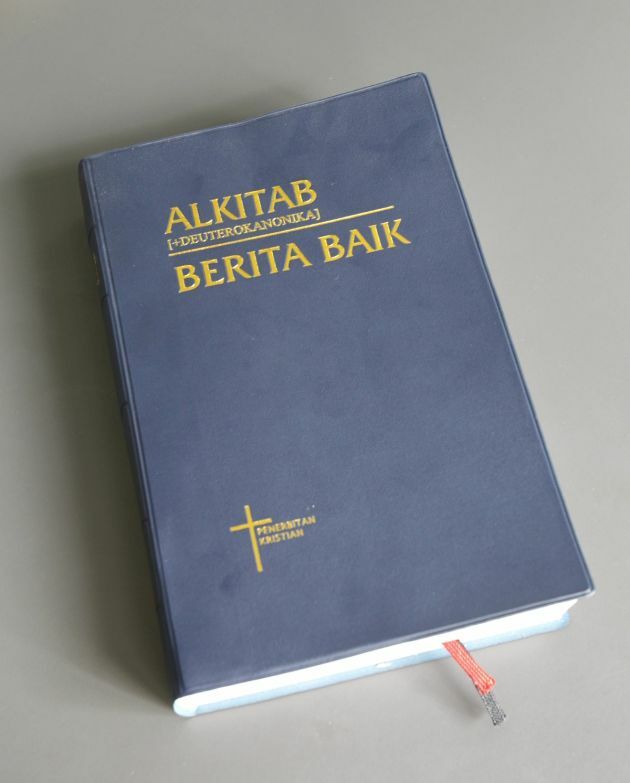 (Photo: REUTERS / Bazuki Muhammad)A Malay language Bible is pictured at a church in Kuala Lumpur March 30, 2011. Rising Christian anger in mainly Muslim Malaysia over the government's handling of a case involving seized Bibles could complicate Prime Minister Najib Razak's bid to win back the support of minorities ahead of an early general election. Malaysia'a national interfaith council has appealed to the Attorney General of Malaysia to settle a lingering debate over the roles of the civil and Shariah courts, which administer Islamic laws. The request follows two recent events that showed differences between the legal authorities and Islamic religious authorities. The Malaysian Consultative Council of Buddhism, Christianity, Hinduism, Sikhism and Taoism issued a statement last week on two contentious issues relating to Sharia. One was a bitter child custody battle between a Muslim convert and his former Hindu wife and the other involved seizure of Bibles by an Islamic group in January. Kindergarten teacher, M. Indira Gandhi, who is embroiled in an interfaith custody battle, returned to court Monday seeking justice after the police's refusal to adhere to a court order to locate her daughter and arrest her ex-husband, the Malaysian Insider reported. Indira Gandhi filed a judicial review application, naming the Inspector-General of Police Tan Sri Khalid Abu Bakar as the respondent, at the Ipoh High Court registry. She wants the court to direct Khalid to execute his duties in accordance with the law or face contempt proceedings. Malaysia is an Islamic majority country, Muslim account for 61 percent of its 30 million people, Buddhists 20 percent, Christians 9 percent and Hindus just over 6 percent. The interfaith council president Jagir Singh said "It was very clear from at least three Federal court decisions that the Shariah courts were subordinate courts. As such the police must enforce the civil court orders." The discrepancy persists said Singh citing a recently issued statement by the Inspector General of the Police where officials said the civil and Shariah courts were on equal footing. Police appeared reluctant to implement the order of the Ipoh High Court which is hearing the child custody battle involving Indira Gandhi and her former Muslim spouse, arguing that the Shariah court was on the same level as the civil court. Last month, the high court had ordered the arrest of the Muslim convert locked in the child custody dispute. The man claims the Shariah court granted him the custody of their three children, while the high court gave Indira Gandhi custody of their children. For his part, Singh pointed out that police force is a federal body and not an Islamic force, thus it must take orders from civilian bodies such as the high court. The interfaith council president advised the police inspector general to seek clarification from Attorney General Abdul Gani Patail. "The remedy lies with the A-G making a statement that as the law stands, the civil court order must be followed," said Singh, a lawyer by profession. He also pointed out that only civil courts can make interpretations of the federal constitution which created them, unlike the Shariah court which was constituted by the State. Singh also reiterated his appeal for the Selangor Islamic Religious Council and the Selangor Islamic Religious Department to return some 321 Bibles seized from the Bible Society of Malaysia. His call was joined by the Rev. Hermen Shastri, general secretary of the Council of Churches of Malaysia. "Both the Federal and State governments should help to defend the right of minorities to practise their faith and resolve the matter by upholding the Federal Constitution," said Shastri, quoted by the Sun Daily on June 26.